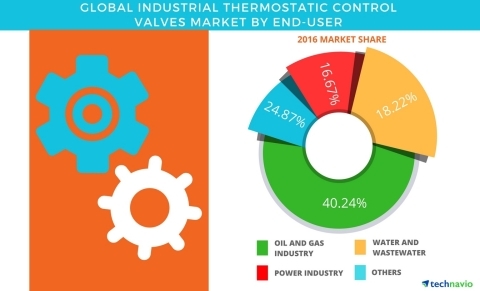 According to the latest market study released by Technavio, the global industrial thermostatic control valves market is expected to reach USD 1098 million by 2021, growing at a CAGR of more than 5%. This research report titled ‘Global Industrial Thermostatic Control Valves Market 2017-2021’ provides an in-depth analysis of the market in terms of revenue and emerging market trends. This market research report also includes up to date analysis and forecasts for various market segments and all geographical regions. The rising number of applications in the power industry and the rapid adoption of automation in the end-user industries is the primary reason for the growth of the industrial thermostatic control valves market. Industrial thermostatic control valves will subsequently experience an upsurge in growth with businesses looking to incorporate safety measures within industries, by adhering to the government standards and minimizing the impact of hazardous operations on industrial workers. The power industry is expected to witness the maximum adoption of thermostatic control valves during 2016-2021 due to series of fresh investments, especially in the APAC region. Many thermostatic control valves are employed in oil and gas plants to accommodate complex operations, such as draw works, drilling, service rigs, mooring, and mud pumps for oil explorations. The drop in crude oil price by 50% in 2014 as compared with 2013 created a huge imbalance in the oil and gas industry, and thus, the profit margin of oil producers was impenetrable. The low oil price crisis will bring slow growth for the thermostatic control valves market during the forecast period. Many opportunities for revenue generation for the thermostatic control valves market will be provided by the water and wastewater treatment industry during the forecast period. The water and wastewater treatment industry needs to ensure highly error-free production by ensuring the water conductivity, pH level, corrosion rates, and other parameters as per the measuring standard during the treatment process. “Growth in population and rising water applications will contribute to modern treatment facilities for both raw and wastewater. Thermostatic control valves are expected to play a key role in regulating temperature and flow rates in water pipelines,” says Raghav. Developing countries across the world are expanding their power generation capacity to address the rising demand for energy. The third major revenue contributor to the industrial thermostatic control valves market is the power industry. Countries are investing in advanced technologies and equipment to scale up production capacities due to increased demand for power. Many industrial valves for various solar and wind power plants are deployed by countries like China, India, and South Korea, which will augment the need for thermostatic control valves. China is the largest wind power market. 138GW capacity wind power projects were sanctioned in China during 2011-2015. The government initiative toward sustainable energy provides incentives and fuels the growth of power industry in China.